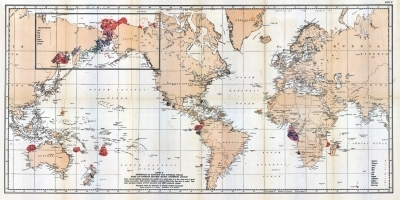 The Townsend Whaling Charts were published as a series of 4 charts with the publication titled "The distribution of certain whales as shown by logbook records of American whale ships" by Charles Haskins Townsend in 1935, in the journal Zoologica published by the New York Zoological Society (now the Wildlife Conservation Society). The 4 charts show the locations of over 50,000 captures of 4 whale species; sperm whales (36,908), right whales (8,415), humpback whales (2,883) and bowhead whales(5,114). 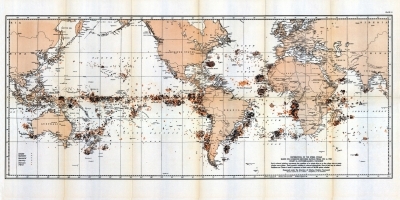 Capture locations were transcribed from North American (“Yankee”) pelagic whale vessel log books dating from 1761 to 1920 and plotted onto nautical charts in a Mercator projection by a draughtman. Each point plotted on the charts represents the location of a whaling ship on a day when one or more whales were taken and is symbolized by month of the year using a combination of color and open and closed circles. Townsend and his draughtsman plotted vessel locations as accurately as possible according to log book records. When plotting locations on an earlier sperm whale chart published in 1931 the draughtsman spaced points where locations were very dense, “extending areas slightly” for a number of whaling grounds. However for charts in preparation at this time Townsend states that “this difficulty is avoided by omitting some of the data, rather than extend the ground beyond actual whaling limits”. 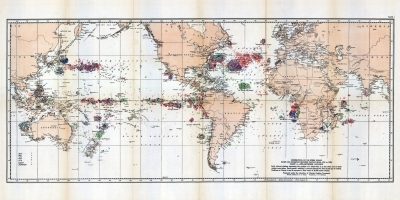 We assumed that this statement refers to the 1935 charts but there is still some question as to whether the draughtsman did in fact space locations and thus expand whaling grounds. Original copies of the charts were professionally scanned at a resolution of 200dpi using a large format scanner. In 2003 a project to convert the whale take locations depicted by the charts to a GIS data format was completed. The scanned charts were geo-referenced in their native the Mercator projection using GIS software (ESRI ArcView 3.2). Each vessel capture location plotted on the charts was then digitized as a point feature and attributed with the month of capture. One GIS data file (ESRI shapefile) was created for each whale species. Digitizing errors include missed points, particularly from areas of high point density and incorrect assignment of month of capture because of difficulty distinguishing between chart colors. However to limit these errors multiple checks of digitized and chart locations were made and color enhancements of chart scans were used to ensure correct month assignments. Overall we are confident that at least 95% of catch locations have been digitized and that at least 95% of month attributes are correct. For more information about the Townsend charts please contact Gillian Woolmer (gwoolmer@wcs.org) or Dr. Eric W. Sanderson (esanderson@wcs.org). Charles Haskins Townsend (1859–1944) was appointed the Director of the New York Aquarium in 1902 when management of the Aquarium was taken over by the Wildlife Conservation Society, then the New York Zoological Society. Townsend remained the Aquarium Director until 1937. For further information about Townsend and his works please contact the Wildlife Conservation Society Library located at the Bronx Zoo, New York, USA. Townsend, C.H. 1935. 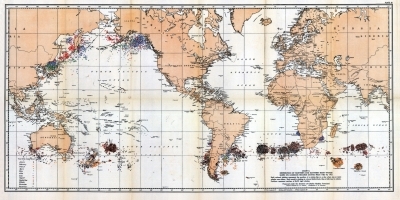 The distribution of certain whales as shown by logbook records of American whaleships. Zoologica 19, No. 1:1-50, 4 charts. Townsend, C.H. 1931. Where the nineteenth century whaler made his catch. Zoologica 34, No. 6:173-179.